Here are directions to some of the many sites where we work. Take Loxa Road (CR 1100E) to the stop sign at CR 1000N, turn east, go 0.3 mile to CR 1130E, turn south and go to the dead end. From Westfield take the Clarksville Road 4 miles to Cleone Road, turn left and go 2 1/2 miles to the woods on the right. To get to Coneflower Hill Prairie, take Ill. Rt.121 west from Mattoon to Coles Station, turn left on the Findlay Road and go about 5 miles to the Coles-Moultrie substation on the right. Turn right and go 2 miles to the “T,” then left one-half mile to the brown pole barn. There is a parking lot there and the hill prairie itself is opposite the parking lot on the other side of the road. Douglas-Hart Nature Center is located at the corner of DeWitt Ave. and Lerna Road (CR 13) at the east edge of Mattoon. 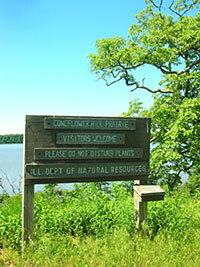 Fox Ridge State Park is 8 miles south of Charleston on Ill. Rt. 130. Take Coles County Road 300N west from Route 130, continue about a mile to the hunter parking at the end of the road. Hanley Prairie is south of the parking along the horseback riding trail. Take 6th Street west from the four-way stop in Neoga, go 2.2 miles past the city limits to Shelby County Road 3425E, turn right and go 0.9 mile past two "S" curves to the woods on the right. Take Reynolds Drive three blocks south from IL Route 16 in Charleston to Carl Sandburg School. Park in back of the school. Follow the directions for Waterworks Hill Prairie but continue to the end of McKinley Avenue. Take IL Route 45 south about one mile from the four-way stop in Neoga and turn right at the cemetery sign. The prairie is just over the tracks. From the cafe at the top of the hill in Clarksville, take 1150 Street north about 1/2 mile to 2100 Road, turn right and go about 1 1/2 miles east to 1300 Street, turn left and go about 1/4 mile to the small parking area on the left. Walnut Point State Park is 3 miles north of Oakland. Take Route 130 south from Charleston to Daileyville Road (CR1470N). Warbler Woods is 1/2 mile down the road to the gate at the second left turn. Embarras Ridges is another 1/2 mile down the road to a parking area on the right. Take IL Route 130 six blocks south from the junction with IL Route 16 in Charleston. Turn east on McKinley Avenue and park at the corner of McKinley Avenue and Stoner Drive West. The hill prairie is on the north side of McKinley Ave., down the steep slope and across the gully. Take IL Route 130 2 miles south from the junction with IL Route 16 in Charleston. The entrance to the site is on the left.